We flew direct from London Gatwick to Stavanger, and by mid-day we were ready to explore the city. Although one of the largest cities in Norway, Stavanger is relatively small and most of the main sights can be seen within a few hours. Make sure to check out the harbour, the old town, and Ovre Holmegate - an amazing street full of colourful painted cafes and restaurants. The main reason for visiting Norway was to hike to Pulpit Rock (also known as Preikestolen). I'd seen so many photographs on Instagram and Pinterest that I knew I had to visit. It's one of the easiest hikes you can do in Norway, and is an amazing day trip from Stavanger. All you have to do is take a short ferry ride and a bus to the start of the hike, and then it's roughly a 5 hour trip. (two hours there and back, one hour at the top for lunch and photographs). Also, if you're worried about the walk being difficult - don't be. It's suitable for people of most fitness levels, and there were even families doing the hike! To get from Stavanger to Bergen we opted to take the ferry. The journey takes around 5 hours, so be sure to take a good book or a pack of cards to keep yourself entertained. Also, a noteworthy piece of info is that the port in Stavanger isn't in the centre of town, you need to take a bus to get there! Remember to purchase the bus ticket alongside your ferry ticket here, which will take you from the centre of Stavanger to the ferry terminal. In Bergen there are no issues as the ferry terminal is within walking distance of the city centre. You should then have the afternoon to explore Bergen. When we visited it was pouring down with rain so we went and explored the aquarium. It's known to rain a lot in Bergen, so definitely take a good raincoat and an umbrella when you visit. 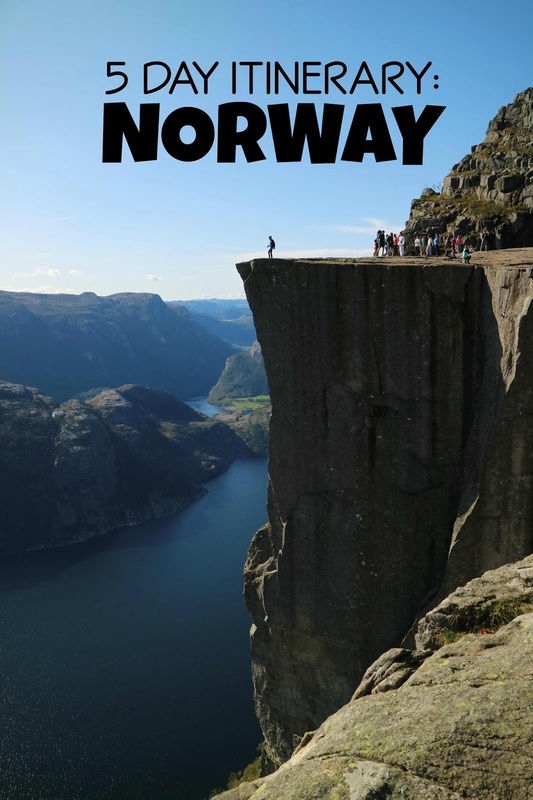 Possibly the most well-known trip to take in Norway is the 'Norway in a Nutshell' tour. There are a few different variations, but each tour allows visitors to see the Norwegian fjords and landscapes in a short space of time by using a combination of buses, ferries, and trains. We did a day trip that started and ended in Bergen. We first took the Bergen railway to Voss, which went through beautiful scenery, where we then took a bus from Voss to Gudvangen. After a short stop in Gudvangen, we then took a ferry through the incredible fjords to Flam. We then had a small amount of time to explore before getting on the Flam railway to Myrdal, and then back to Bergen. It was a long day, but definitely worth it. For the final day in Norway, the rain had eased off so we were lucky to explore Bergen in glorious sunshine (still pretty cold though, we visited in September). Be sure to check out the harbour and Bryggen - the Old Town with amazing wooden buildings. Another must-do is the funicular to the top of Mount Floyen; the views over the city are incredible. I'd love to visit Norway but the costs are putting me ff slightly - I think this will be one for a year that I have no extra expenses. These pictures are beautiful, and your tips are very helpful!